At the London Preschool we provide our children with high quality experiences to foster mathematical development and understanding. Number and numeral recognition, shape recognition, measurement, patterning and representation of data all form part of our mathematical curriculum. As with literacy we provide activities to foster early mathematical skills from the day children start with us. The baby who is reaching out to hold and feel the ball is making a start at understanding a circle and positioning. The toddler who is building a tower of different shaped blocks is learning to count and order and staring to get a sense of how different shapes work together. The two year old creating a line of red bricks and one of blue is beginning to match and become aware of similarities and differences. Through singing number rhymes and songs and counting objects by rote wherever they go, our young children learn to count the stairs, the steps they are taking etc and to come to understund number. Our qualified Early Years teachers focus on developing early mathematicians through planned stimulating age appropriate activities and through using accurate mathematical language in their discussions with children. 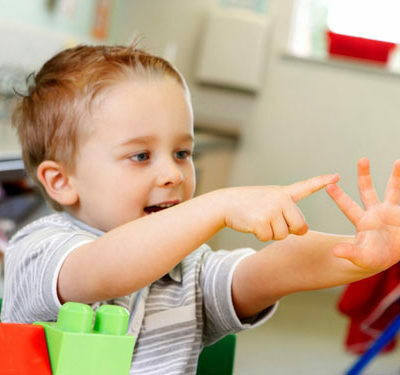 They plan to help children move from rote counting to one to one correspondence so that they can associate a number with an object and numeral recognition. The London nursery rooms have meaningful illustrations of numerals so that the symbols become familiar to our children. Skills such as learning to add and subtract develop through using real objects and routines in the day such as setting the table for lunch to practice these skills. Patterning, the regular arrangement of objects shapes or number is important in mathematics, literacy and science. Recognising and understanding patterns in music and creating patterns in art as well as ordering objects such as threading beads, cars or blocks in patterns all lead to children coming to understand the rules of patterns. Being able to count odd and even numbers for example relies on this understanding. Data collection and organisation is the final strand of early mathematics at the London Preschool. This involves sorting and matching at the toddler stage, classifying, counting, measuring and comparing as they get older. Children sort in their play, dividing the wooden blocks from the non wooden ones for example. Later they sort for a purpose, sorting by colour or shape and then they begin to sort by more than one attribute and can verbalise their sorting rules. Graphing and mapping is a direct extension of sorting and classifying and when presented visually helps children see information in different forms. Our teachers create pictorial graphs depicting the different ways our children come to preschool, the number of children with different colour eyes etc. and our teachers help them to interpret the data by asking pertinent questions.